The bug Darwin speaks of is a member of a group colloquially referred to as “kissing bugs.” Scientifically speaking, the “great black bug of the Pampas” was probably a bloodsucker called Triatoma infestans, an insect which is the primary vector of a parasite called Trypanosoma cruzi. 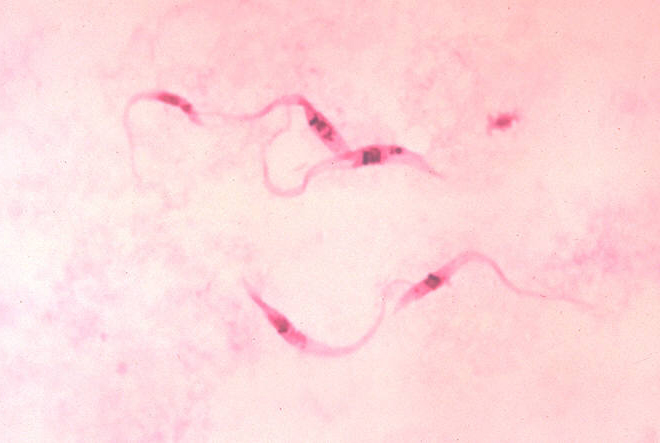 This parasite causes Chagas disease, a debilitating infection that harms the victim in two stages: an acute phase that begins about a week after the bug bite and causes fever and occasional swelling at the site of the bite, and a chronic phase that shows up as long as 25 years after exposure, where the patient’s organs are irreversibly damaged. Organ damage primarily targets the heart and digestive system. Chagas disease is endemic throughout South and Central America and Mexico, resulting in about 6 million new cases and 7000 to 12,000 deaths per year. Though still rare, increasingly cases have been diagnosed in the U.S. as well, for two main reasons: movement across borders by infected individuals, bringing T. cruzi with them from endemic countries; and new infections acquired in the U.S., which are extremely rare. 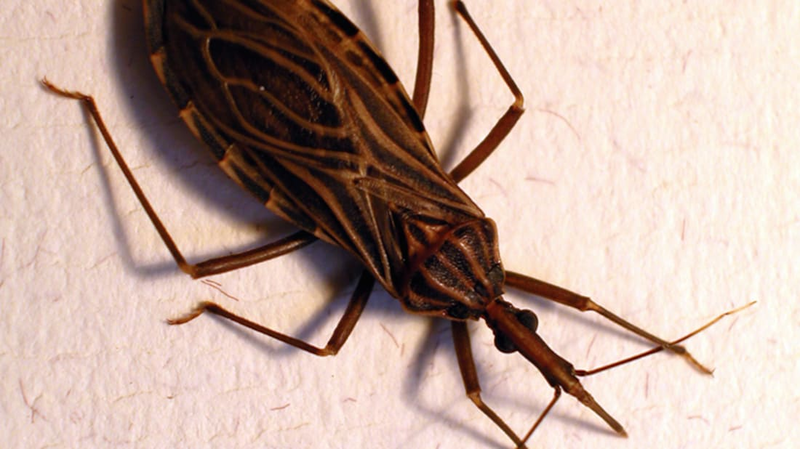 The kissing bugs that spread Chagas disease can be found in 28 states, though they’re most common in Texas, Arizona, and New Mexico, but human bites are rare—the bugs are able to feed on a wide variety of animal species. While most people may not view kissing bugs as a fearful threat today, that wasn’t the case for a short period in the summer of 1899 when kissing bug hysteria reigned in the U.S., according to a research team led by Melissa Nolan Garcia at Baylor College of Medicine. By revisiting newspaper and magazine accounts of purported kissing bug bites from 1899, the researchers found that the bugs were blamed, often sight unseen, for a wide variety of bites (and symptoms). But while the "epidemic" may have been overblown, there's something intriguing about this "outbreak." The scientists say it's possible that Chagas may be endemic to the U.S. after all—and this insight may help us better understand the current re-emergence of the disease. Awareness of the mysterious epidemic began with an article in The Washington Post on June 20, 1899 (“Bite of a strange bug”), eventually resulting in more than 60 articles on the kissing bug epidemic across the country. Reports of the bites were concentrated in the Northeast, with a handful of cases in the Midwest and one each in California and Georgia. Though most of those bitten recovered without incident, several fatalities were reported, with one noting that the cause of death was the “sting of a kissing bug”—though it should be mentioned the bug was identified by neither the patient nor the coroner. Robert Bartholomew, author of Panic Attacks: The History of Mass Delusion, points out that this was the case for most reports of kissing bug bites and deaths: The bug itself was never seen. This is what the T. cruzi parasite that infects kissing bugs looks like. They may not have had fangs or been a half-foot long, but were kissing bugs blameless? Government entomologist Dr. L.O. Howard stated in the August 20, 1899 New York Times that the epidemic wasn’t entirely a myth. While he noted that these bugs had been “known to science for 50 to 75 years,” he suggested the bug may be more prevalent in the summer of 1899 due to “climatic conditions favorable to the propagation of the insect.” Temperatures in the Northeast, where most of the reports originated, were 2 to 3°C higher than normal, which could have led to an increase in both kissing bugs and other biting insects. … the so-called "kissing-bug" scare has been based upon certain undoubted cases of the bite of one or the other of them [species of kissing bugs], but that other bites, including mosquitoes, with hysterical and nervous symptoms produced by the newspaper accounts, have aided in the general alarm. This end-of-the-century flare-up preceded the official identification of the disease by a decade. The cause of Chagas disease wasn't recognized until 1909 by Brazilian physician Carlos Chagas, so there was no way in 1899 to test bitten individuals for the parasite or to recognize kissing bugs' role in transmitting the disease. The 1899 epidemic provides a couple of lessons. One, it suggests that Chagas disease may not be a recent import, and emphasizes that the disease’s insect vectors have long been in the country. Second, it provides a lesson in media-driven fear as an epidemic unto itself—something that is only amplified by the internet. Like Charles Darwin—who is suspected of having suffered from Chagas disease—we’re left with mere speculation and hype.